There is something endearing and homey about a little box on the countertop, though, with special recipes typed or written on index cards nestled inside. Not only are recipe cards a wonderful way to preserve your treasured favorites, but they can also make thoughtful gifts the recipients will cherish. What college student, newlywed or first-time parent wouldn’t love a collection of family favorites – Aunt Dee Dee’s sweet potato casserole, Grandma’s hearty chicken soup and Dad’s five-alarm chili – to help them create new memories and feel connected to old ones? 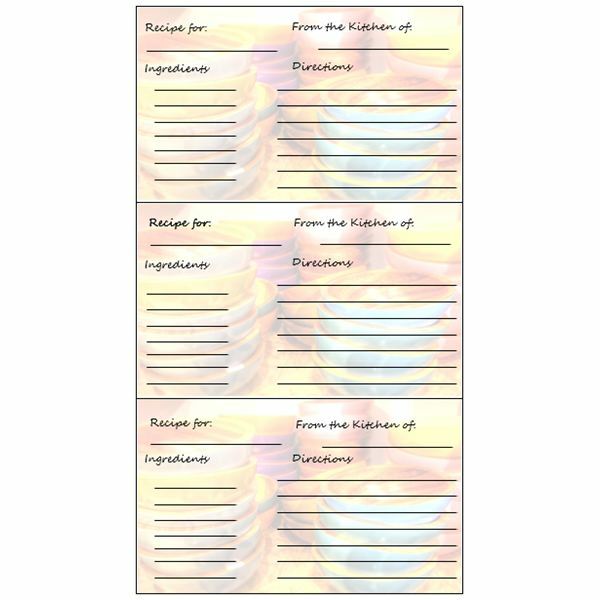 The recipe card templates that follow are for Microsoft Word, so you have the option of downloading and printing them as they are or customizing them and filling them with recipes. With so many different design options, you are sure to find something to suit you or your loved ones, as well. At your family’s Easter get-together, someone always requests the recipe for your amazing glazed carrots. 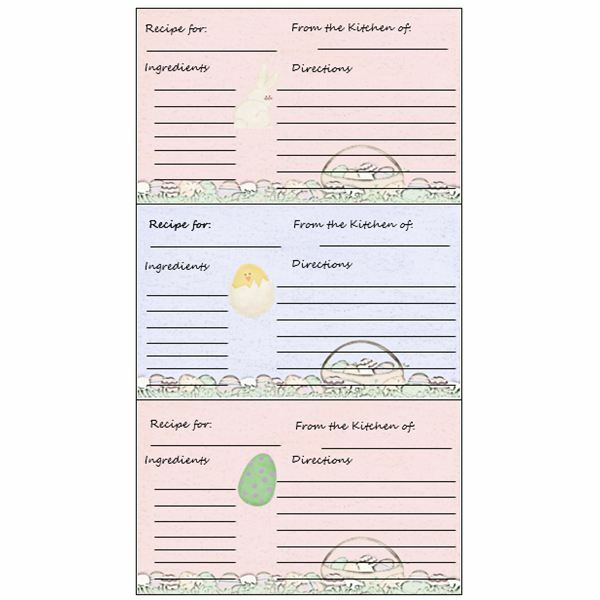 This year, you can come prepared when you print a stack of these charming Easter-themed recipe cards. Each card in this set of three to a page is slightly different with pink and purple holiday backgrounds and embellishments including a fluffy bunny, a cute chick and a sweet egg. Stacks of bright wooden bowls serve as the backdrop for these cards, which print three to a page. Invisible text boxes placed over the lines for Recipe Name, From the Kitchen of, Ingredients and Directions enable you to type directly onto the lines, although you can print blank cards for handwriting, as well. 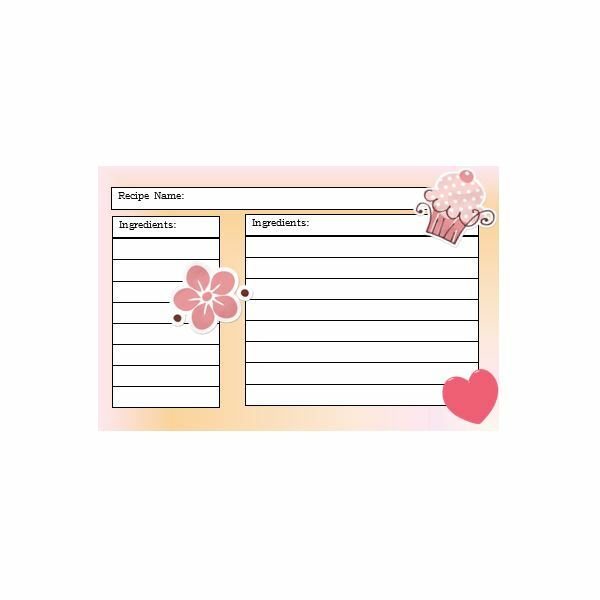 Ideal for a baker or just someone who loves all things sweet, pink and adorable, this template produces two recipe cards per page. The background of these cards is gradient pink and peach with white boxes into which you can write or type ingredients, directions or other details. Embellishments include cupcake, heart and flower digital “stickers." Sometimes simple is best and these cards are unpretentious and practical while still delightful to look at. A pink border surrounds the card with a sweet pair of hearts adorning both the top and bottom. You can type the recipient’s name (or your own) at the top of each card, which prints four to a page. In addition, you can type the name of the recipe, the ingredients and the directions directly into text boxes atop the lines or print out for writing on later. 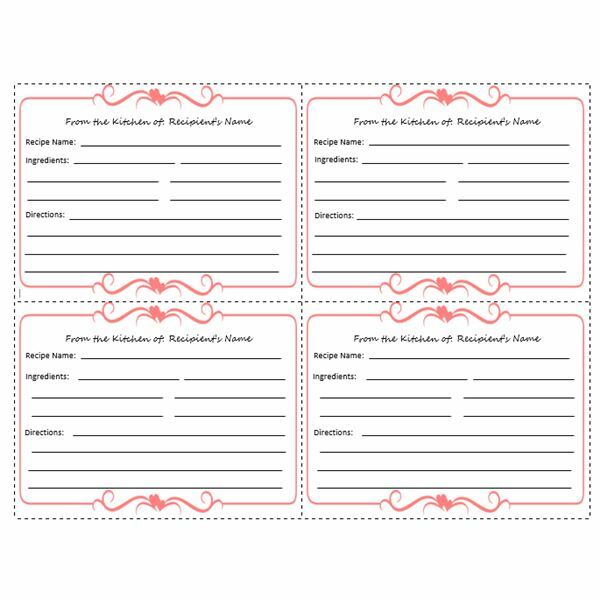 For a slightly less traditional option, consider these simple yet slightly edgy recipe cards. 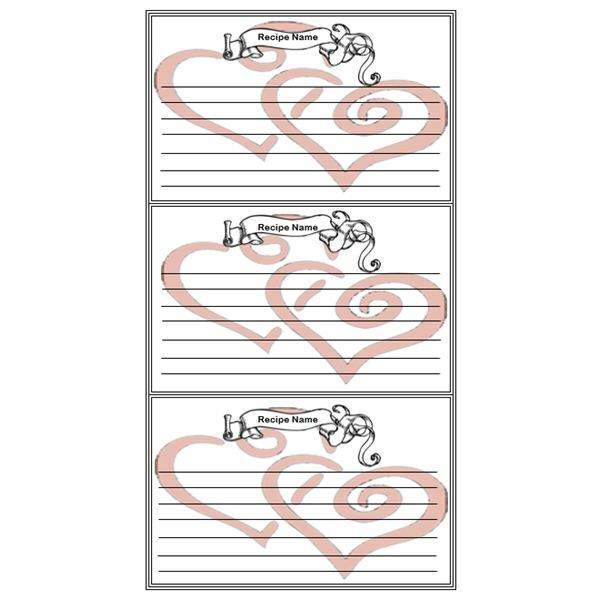 Printing three to a page, each card has a black double-lined border. A pair of washed-out red hearts with black outlines sits in the background and a flowing black and white banner is a placeholder for each recipe name. The remainder of the card consists of lines onto which you can write or type the details of the recipe, such as ingredients and directions. Have an idea for your own custom recipe cards? Start with a label template, such as Avery 5264, which you can access by clicking Labels on the Mailings tab. Another option is to make a table with one or two columns and two or three rows to serve as the card outlines. Add your favorite images, fill colors, fonts or even digital scrapbooking embellishments. When you are done, save the document as a template to use again later. Press F12 to open the Save As menu and choose a template option in the Save as Type list. Have other tips to share? We’d love to hear them – just leave a note in the comments!